The Action Movement™ was founded in 2011 as a heartfelt powerful initiative to help experts, executives and entrepreneurs make a greater impact and capitalize on the measurable results they create with their message, products and services. Since then, the Movement has spread around the globe, powered by the strategic collaboration of passionate difference-makers and driven by the conviction that success is defined, not by the money we receive for our products and services, but by the difference we make in the lives of the people we serve. The Action Movement™ Community of Difference-Makers™includes bestselling authors, speakers, coaches, consultants, marketers, teachers, trainers, psychologists, executives, CEOs, physicians, dentists, chiropractors, veterinarians, artists, entertainers, publishers, non-profit volunteers and founders, lawyers,attorneys, CPAs, financial advisors, physical therapists, wellness professionals, spiritual guides, thought leaders and top influencers from around the globe. Our expertise is widely varied, and we are bound by a burning desire to make a significant impact by developing and delivering ethical products and services people actively use to live healthier, happier, safer, more productive and fulfilling lives. We look forward to welcoming you into our rapidly growing, collaborative community where you will find strategic partners and supportive friends. To join our extraordinary community, simply please read and agree to the 7 Tenets of The Action Movement Manifesto. WENDY LIPTON-DIBNER, MA is a social researcher by training and an entrepreneur by choice. She's built 10 multimillion-dollar retail and service businesses of her own, and helped thousands of Fortune, healthcare, entrepreneurial, and non-profit organizations increase revenues exponentially by making a measurable difference in every life they touch. 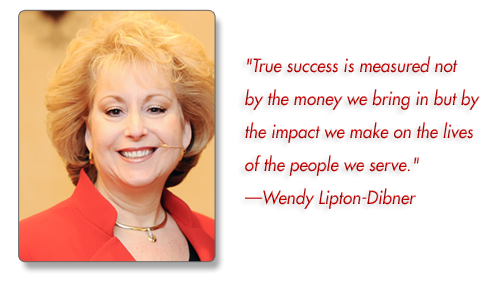 An internationally-recognized authority on Impact Strategy, Wendy has touched millions of lives through 5 bestselling books, world-class speaking engagements, sold-out live events, and popular media appearances. She has presented at the U.S. Senate and produced well-over 1,000 business growth programs for difference-makers around the globe, proving time and again, "When you Focus On Impact® the money will come!" Wendy currently works as President and CEO of Professional Impact, Inc. and Impact Resources, Inc. where she helps difference-makers grow profitable businesses by maximizing and capitalizing on the impact they bring to people's lives through one-of-a-kind marketing, products and services, and serves a trusted advisor to top influencers, executives, and impact-driven entrepreneurs worldwide. Forbes calls Wendy's strategies, "The secret to success in business," and Inc. describes her Focus On Impact® strategic map as, "Your path to profitable success."